Volvo XC60 – a car that stops traffic! Dressed in a thrilling blend of muscular Cross Country capability and the dynamic, sporty charisma of a coupé, the Volvo XC60 is stepping boldly into one of the most competitive and fastest growing segments in the automotive world. The Volvo XC60 was one of a host of compact luxury SUVs that emerged on the market over the last couple of years. However the arrival of Land Rover’s Evoque changed the game for crossovers forever. In one clear swoop the Evoque raised expectations and moved everything up a gear. The D3 Geartronic diesel 4×2 was the version I tested. This 2.0 diesel has120kW and 420Nm torque and is good to drive with lots of residual power. The D3 is a downsized version of the five-cylinder D5 turbodiesel we all know so well. The fuel system uses a different type of piezoelectric injector that minimizes consumption by means of exceptionally rapid and precise injection pulses under high pressure to promote combustion efficiency. The previous model was a handsome vehicle with an aggressive front and a modern Interior so it’s good to see that little changes have been made to the exterior styling of Volvo’s XC60 crossover. It has great road presence and there is a distinct Swedish coolness about the overall styling. As this car segment’s name so clearly reveals, Volvo Cars’ XC60 crossover is spiced with the very best from two car types. Down below, the unmistakeable, capable XC muscles are pumped up, creating a strong athletic body that is mated with high ground clearance and large wheels. Up above, the flowing lines create the sporty charisma of a coupé. The sculpted, seductive lines are particularly clear when the XC60 is viewed from the side. The car’s shoulders are exceptionally broad. The large wheels, the bold wheel arches and the darker livery of the body’s lower section further enhance the muscular XC feel, while the dynamic, flowing lines of the XC60’s greenhouse combined with its daring roof contour impart a sporty coupé feel to the upper part of the car. The main attraction of the compact SUV is that they are far more carlike to drive than 4x4s but you still get the benefit of extra ground clearance of 230 mm and the higher seating position. Despite the compact proportions of the XC60 on the road it feels on the large side. The XC60 is a likeable car and one you will actually enjoy driving. The low down torque comes in very handy with more than sufficient performance; town driving is really a pleasure. The D3 returns 6.8 litres per 100 km on a combined cycle. Inside the interior design is clean and the ergonomics are excellent. The seats are incredibly comfortable and the interior conveys a sense of luxurious well-being, never has such safety been delivered with such style. Quality materials are used throughout the modern interior and the beige and dark brown upholstery and trim finish off the look beautifully. Inside, there is more than enough room for five adults to ride in comfort. Load capacity is 495 litres with five aboard, rising to 1,455 litres with the seats down. Volvo’s world-class audio systems are part of the First Class experience inside the new XC60. The highest level, the optional Premium Sound system, features 12 Dynaudio loudspeakers and an amplifier with Dolby Pro Logic II Surround delivering 5 x 130 Watt. An optional digital subwoofer under the floor in the XC60’s load compartment provides an additional 260 Watt. The sound can be optimised to suit three different situations – driver’s seat, both front seats or rear seat. As expected of a Volvo there is no compromise regarding safety and the XC60 is equipped with Emergency Brake Assist, Roll Stability Control, and Side Impact Protection System are provided. Electronically controlled ABS braking system with EBD and traction control ensures whatever the surface, the car stays put. zones, safety cages, airbags and whiplash protection to systems for dynamic stability and driving control. Volvo Cars regards it as the safest Volvo yet, with the unique City Safety system as a standard feature and a tribute to Volvo’s firm commitment to its core value of safety. The biggest single new feature in the XC60 is probably City Safety – a revolutionary system that will stop the car by itself to help the driver avoid or reduce the effects of the type of low-speed impacts that are common in city traffic and traffic tailbacks. City Safety keeps an eye on traffic in front with the help of a laser sensor that is integrated into the top of the windscreen at the height of the rear-view mirror. It can detect vehicles and other objects up to 10m in front of the car’s front bumper. City Safety is active at speeds of up to 30 km/h. If the vehicle in front brakes suddenly and City Safety determines that a collision is likely, the brakes are pre-charged. If the driver remains inactive, the car applies the brakes automatically. The Volvo XC60 is a likeable car and it makes an ideal alternative to a traditional estate and will appeal to safety-conscious drivers. All Volvos come with a Warranty and Maintenance plan of 5 years/100 000 km. 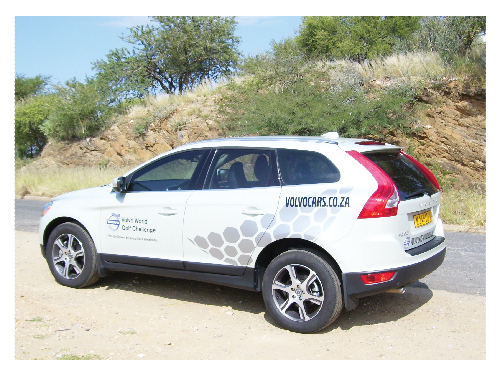 The Volvo XC60 D3 2.0 Diesel Geartronic sells for N$449,900. Call Johan Lucas now at 061-2924102 and arrange a test drive that you will remember for the rest of your life.